I will never be a great Indian cook. As a result of this fortunate misfortune, the Indian meals that come to being under my hands, in my own estimation at least, will never, ever measure up to the meals of my parents and grandparents and aunts and uncles. Theirs are just so much better. They've absolutely ruined me for anyone else's Indian cooking, even my own. I do try. The trouble is, even if I meticulously weigh and measure and take note of every single flick of the wrist and dash of spice and cooking time down to the millesecond, I cannot replicate the magic of the food that is served from my parents' kitchen. I am respectably proficient in the recipes I consider essential to the recreation of childhood meals, and I might even be so bold to call myself good at cooking them. But honestly, if it came down to a bowlful of my channa masala (spiced chickpeas) or a spoonful of Mum's, I would most assuredly pick the latter. Frustrated and hungry, I branched out on my own. My immediate and extended family is of a diverse enough background that a variety of Indian cuisines are often represented at our table. I took that thought and ran with it - seeking out recipes that had no particular tie to my family but had a general place in the geography of our heritage. The practice has been a successful one. The dishes have been familiar enough to have an emotional resonance for me, which really, is such an essential part of the way we cook and eat, but yet their unfamiliarity saves them from comparison or prejudice. I'm not giving up on those family recipes, my word no. But while I'm learning, it's a start. I fry chopped bindis (okra) among onion and tomatoes, and can stir up a thick gravy for kofta (meatball) curry. I have served generous bowls of peppery Mulligatawny, puréed until velvety smooth (an utter departure from my family's recipe). Then there are recipes like this cauliflower, that isn't classically Indian at all, but retrains enough of that spirit that it feels comfortable to have around. It feels like something I've been eating for years. When making dal, the ubiquitous stewed lentils that are found throughout India, the dish is usually finished by tempering - a process called tarka (that's the way we pronounce it, but it can also be spelled tadka). It is a last-minute seasoning of the lentils with roasted spices cooked in ghee (clarified butter) or oil (often mustard). 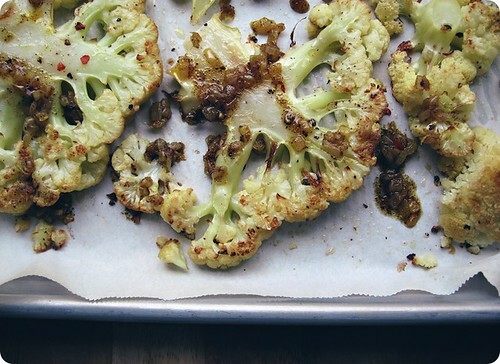 Here the aromatic butter is poured over roasted cauliflower, for an unexpected vegetable. The cauliflower is presented in thick slabs, like a coral specimen from the mysterious deep, pressed under glass with it's spindly-limbs artfully arranged just so. After roasting, even the fibrous stalk looses its tenacity as everything goes soft and sweet. Hot from the oven, the cauliflower gets bathed in butter thick with spice and succulent nuggets of onion. It's taste is so reassuringly that of home to me that I get woozy with nostalgia just thinking about it. And see in the photographs where the sauce collects and pools? I'll let you know now that you'll want to drag your cauliflower through those collected juices so that every crenulated tip is filled with the piquant liquor. One swipe, and you'll thank me. Scratch that, no thanks necessary. Just be sure to save me a piece. The spice blend is called garam masala, from the Hindi words "warm" and "spice"; with masala suggesting a combination of spices rather than a singular. It is without a standard recipe, with each household seemingly with its own version, but the basic components of coriander, cumin, cinnamon and cardamom, along with chilies are fairly universal. Preheat an oven to 450°F (230°C), with rack on the lower third. Drizzle a rimmed baking sheet, lightly with oil. 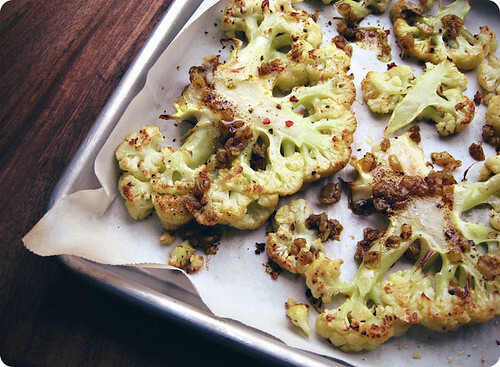 Lay out the cauliflower on the tray and season both sides well with salt and pepper. Roast, turning once, until tender and golden, around 25-30 minutes. Meanwhile, in a small skillet over medium high heat, dry roast the coriander seeds, cumin seeds, cloves, cinnamon, peppercorns, cardamom and chili until fragrant, tossing or stirring often. They might darken, but you do not want to see smoke or for the spices to catch. Watch them closely. Remove the spices to a spice grinder and allow to cool. Once warm but not hot, process the spices to a fine grind. In the same skillet, warm the butter over medium heat. Add the onions and cook, stirring often, until translucent and sweet but without colour. Add some of the spice mix (see note below) and turmeric stirring them thoroughly into the butter. Continue to cook the onions and spices for another minute. When the cauliflower is finished roasting, spoon the butter and onion mixture over. Serve immediately. • If you prefer, the cauliflower can be cut into florets and then tossed through the butter. Adjust the cooking time accordingly. • Use as much or as little of the spice blend as suits your taste, a teaspoon or so would be a good starting point. The onion mixture should be well-spiced and pungent, to season the mild vegetable. Any leftover spices can be stored in a sealed container for a week or so. • If you have a favourite garam masala recipe of your own, feel free to use it here.